Straight out of his own imagination and notebook, Chazz Pitts brings a brand-new piece of acoustic melancholy to the ears of Salt Lake through Mini Golf. 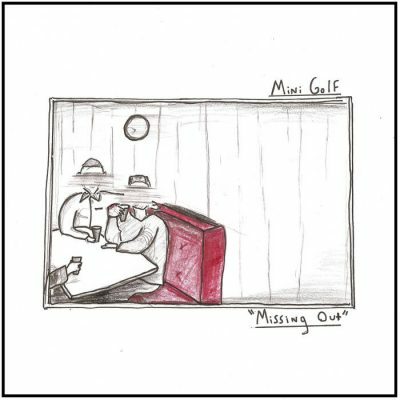 Missing Out is full of raw, truthful lyrics that are easy to relate to, emotional vocals and a guitar that shines among the simplicity of it all. There’s something about this nine-song album that not only offers a melody to bob your head to, but also a sense of emo nostalgia. “Shoelaces” is a 53-second song that starts out the album. It’s completely instrumental and exudes a certain soft sweetness. The incorporation of clicking—which seems to be a cassette tape locking into place—and some slight distortion makes the acoustic guitar shine. All of the little details in the background create a unique sound that add more interest to such a short, simple song. It gives the listener a taste of what Mini Golf is all about in under a minute: just a singer and their guitar. “Elephant in the Room” is a subtle piece that addresses the self-loathing feelings we’ve all felt before. Pitts describes the desperation that comes along with reflecting on life and ourselves and journeying through self-discovery. The track that follows is an interesting piece that comes out as my favorite song on the whole album. “I’ll Be Here A While” is a slower song that consists of a recorded conversation between Pitts and a friend, with Pitts’ acoustic guitar strumming along. It’s a conversation we all have when we feel like there’s nowhere for us to go, that our lives have taken a sudden halt and we don’t know how to move forward. It’s an incredibly relatable song, and the lyrics left a heaviness on my chest.